Are beautiful redesigns, better quality newsprint and more pages the way to halt decline in newspaper sales? 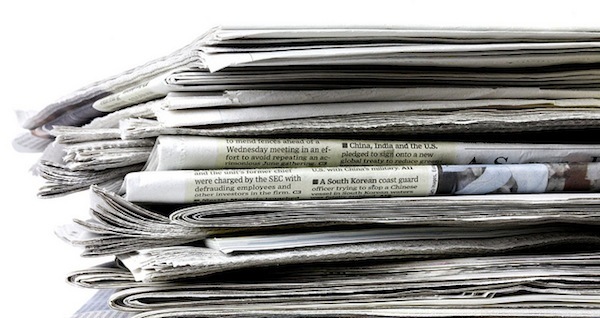 While all newspapers should be well designed, it won’t stop the sales decline. For years I have admired beautifully designed newspapers. I was fortunate to work for some brilliant regional newspaper designers. I’m eternally grateful to them for teaching me the fine art. I even managed to win a Front Page of the Year award, a proud moment. As I cast my eyes across regional daily papers it is clear there are some fantastic looking newspapers. Is design important? On a couple of levels, yes. The design sets the tone for the paper and helps readers to navigate around them. The only problem is that some newspaper groups still think that a new design will drag the readers back and halt the sales decline. Unfortunately, I have not seen any lasting evidence of this. Any real sales lift comes through short-lived promotions such as buy a paper and get a free chocolate bar which is probably at the end of its sell-by date. Yum. There is also the idea that a ‘modern’ design will attract new, hopefully younger readers. Once again, where is the evidence? Is this tinkering while Rome burns? As an editor and deputy editor, no-one ever rang me or wrote to me complaining about the design, there was never a hint that they didn’t like the colours or lay-out on Page 15. The only real complaint in this area was from older readers unable to read the paper because the font was too small or the text couldn’t be read on a tint that was printed poorly on low grade newsprint. On the other side of the coin I had hundreds, if not thousands, of complaints about content. Content is king. So this brings me to the point. Newspaper designs can be wonderful to look at and the friendly rows I’ve had on the finer points of a pastel shade here or a different font there are memorable. However, design is something that really only bothers journalists or the hierarchy (attempting to have a pretty looking shop window before a sell-off) more than its readers. There is a difficult sum. With a decline in sales there’s a revenue shortfall. The answer for newspaper groups is to lop a few more pence on the cover price. The outcome is…a further fall in sales. As an aside, I have always thought that newspapers were too cheap. But the problem is that they have been cheap throughout time and it is ingrained in readers that they should cost as little as possible. With this embedded cheap as chips culture, any price rise is looked at as a criminal offence by disgruntled readers who stop buying the product. The latest ploy by some papers is put the price up, maybe even improve the quality of the paper and then add pages to the paper so it has more of a ‘kill the cat feel’ than the present feather light versions. However, with fewer staff and more pages to do, the outcome will not really benefit of readers. It just means spreading the content more thinly across more pages. So what do you end up with? A bigger paper in terms of pages, possibly better quality newsprint, but the same amount of stories spread across more pages and it will cost you more. Sounds like a bit of a con. Is this a recipe for success? I’ve been down this road before. It certainly doesn’t provide the answer to how this industry can survive the 21st century. This entry was posted in Journalism, Journalists, Newspapapers, Newspaper design, Writing and tagged Cover price, Journalism, Journalists, Newspaper design, Newsprint, Richard Bowyer, Writing by Richard Bowyer. Bookmark the permalink.